When a friend of my daughter invited her to his party, there was a need for a present to be bought or made. This was for a young boy, and my daughter has always liked to give girly handmade aprons as birthday gifts. This this time, a different type of material was required. She liked to made the aprons hersel, but this time, I was given the task. I had previously bought a cushion cover in a sale and it was still wrapped up with no home to go to! 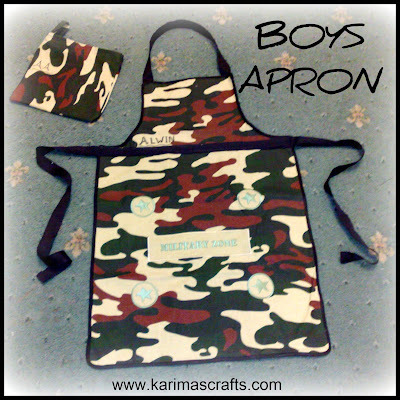 It was a camouflage style material and I thought this would be ideal as an apron for a young boy. The photograph above is the finished apron, with a small bag I also sewed with the remnants. The apron can fold into the bag for easy storage. As my daughter didn’t want to attempt his one, it was down to mummy. I unpicked the edges where the cushion was joined, so I had two square pieces of material. I kept the zip and stored it in my collection. The front part of the cushion was used as the apron skirt, I then used the back part to make the chest part of the apron. I used a black bias tape to go around the outside of the whole apron. I couldn’t find any matching material for the apron strings, so I purchased these (in black) from the Dunelm store. I normally have white apron strings in my collection, but I had never used black before. This was a quick and easy project and took less than 1 hour from start to finish. I will label this as another upcycling project. So now I have made aprons from dresses, skirts and now cushion covers!.